A wonderfully complex Central American bean exhibiting a rich, medium-bodied nature with a spicy or floral acidity and a characteristic dry sensation. 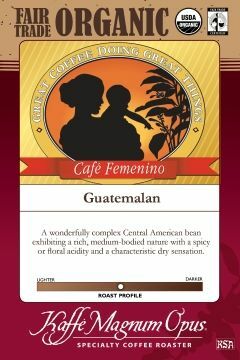 The Cafe Femenino Coffee Project is a social program for women coffee producers in rural communities around the world. More than 1,500 women in Bolivia, Colombia, Dominican Republic, Guatemala, Mexico and Peru are active in the project to achieve empowerment, build social and support networks, and earn incomes through the production and sale of the Cafe Femenino Coffee.